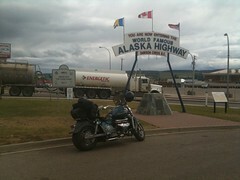 Day 3-Making My Way to the Real Alaska Highway! In my hurry to leave Prince George, BC this morning, it never occurred to me I'd see the last of Internet connectivity for 250 miles... Despite the forecast and black clouds, other than a few sprinkles, the rain held off until I was leaving Chetwyn, BC. man did it dump and I was rather pleased with my rain gear, helmet and windshield. The drops were big enough I felt them through the gear. The ride was fairly uneventful with most of the road in great shape and reminiscent of a run from Anchorage to Seward. Due to the rain or lack of a pull put, the few places worth pictures weren't really feasible. 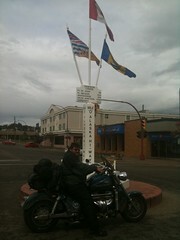 I'm sitting in Dawson Creek now getting ready to start North on the true AlCan. (OK, John P, there's the qualifier!) Here are some shots from there. I ran into several others making the trip South from Alaska. All said the same, "Rain, Rain, Rain, Rain". Did I tell you they said it was raining? A few said they had SNOW in Whitehorse 2 days ago. This is gonna get interesting. The bike is running great and all seems well do far. As usual Grizzly-nauts, I have no idea how far I'll get or when I'll stop riding. Hope to have Internet again so I can post another update. See ya'! Oh! Happy Independence Day )Fourth of July) to you all! Beautiful... was there back in '74 before it was paved.... Nice looking 2 wheeled car...!